You have water damage. You have our sympathy. No time to delay. Water must be removed before mold and mildew begins to grow. Carpets and Rugs - Our commercial grade water extraction equipment will remove up to 95% of the water in carpets and rugs, cleaning them in the process. At your option, we can treat carpets and rugs with a disinfectant to kill any fungi or bacteria that may be present. Deodorize - Carpets and rugs that have been wet for more than a few hours will begin to smell. Bacteria in the carpet can multiple rapidly and produce odors. At your option, we can apply a deodorizing agent that will destroy odor causing bacteria, neutralize any pet odors, and leave the carpet smelling pleasantly fresh. 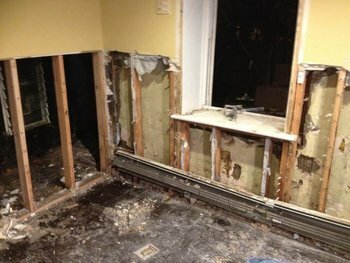 Basement and Room Dry Out - Once standing water has been removed a room or basement will still be damp. We have large fans that can quickly draw remaining moisture from carpet and tile floors, speeding time to total dryness.